If there is any reason you need convincing as to why some movie franchises need to stay extinct, let Jurassic World be your most recent example. How to I start with this? Well, let me start with a positive: Joe Johnston isn’t directing. Thank God, because I couldn’t stomach another Jurassic Park III. Maybe I already have. The movie takes place 20 years after the events of Jurassic Park, which is just as well because it literally is more than 20 years after the original was released. The new plot re-writes the history so that The Lost World and Jurassic Park III never took place. Not a change I will be missing since those movies contributed as little to the series as World does. The film’s cast of characters includes a dinosaur whisperer named Owen Grady (Chris Pratt), who controls his own small battalion of velociraptors ready at a moment’s notice. Yes, you read that right. A velociraptor battalion. You get used to such absurdities as the movie goes on. You have Claire Dearing (Bryce Dallas Howard), the park manager of the newly-designed Jurassic World. Then you have Zach and Gray Mitchell (Ty Simpkins and Nick Robinson), two brothers who go to Jurassic World for a small vacation away from their parents. Oh yeah, and Claire is their aunt. You can tell their parents are really responsible by sending their kids away to an exotic park filled with man-eating beasts and reptiles with their ditzy, airhead of an estranged aunt to take care of them. Anyhow, the upgraded, new-and-improved Jurassic World is a major step forward from Jurassic Park, the failed first attempt at a dinosaur park thanks to the hands of John Hammond. But no worries! Jurassic World is the perfected design of Jurassic Park, and nothing can possibly go wrong! Wrong. They do the smartest thing they can do and create a new carnivorous dinosaur called the Indominus that is more powerful than the T-Rex, Spinosaurus and a pack of Velociraptors combined. Hooray for dinosaur science! As soon as the film opens up, you realize how many stupid characters are packed into the film to create the biggest idiot plot you’ve seen since Idiocracy. Idiot # 1: Whoever decided to create this park after the original one ended so disastrously. Idiot # 2: The mad scientists who decided to create a new carnivorous dinosaur, splicing together the DNA of nature’s most dangerous dinosaurs. Idiot # 3: Bryce Dallas Howard’s character, for deciding to run in high heels the entire movie. Idiot # 4: The park official who thought the dinosaurs could be reused as weapons for tactical takeover. I’m sure he was still wondering what went wrong as one was chewing off his head (Hint: They’re hungry, you moron). Idiot # 5: Mr. DNA, because curse that Clippit wannabe. Idiot # 6: Anyone who thought it was a good idea to pay money to go to this park after knowing what happened at the old one. It’s true, I’m not a fan of this movie’s conception to begin with. The premise itself has so many logical flaws to begin with, its hard to get into the story. But I’ve been faced with worse cases before and have been happily proven wrong. I had doubts before I went into the theaters to see 22 Jump Street and Guardians of the Galaxy, and those ended up being some of the most fun movies of 2014. If done well, a movie can suspend disbeliefs and be what a summer moviegoing experience is supposed to be: entertaining. The problem with Jurassic World is that it undermines its own intelligence, and the entertainment value doesn’t pay off despite it. The script starts off with its flaws of logic in the outset and never addresses them in the film, its characters as oblivious to their own faulty thinking as badly as the screenwriters are. The movie continues with an onslaught of cliches and inaccuracies, some of which I rolled my eyes hard at and wondering if I was watching a Roland Emmerich action picture. Some of the worst blows come in the form of dialogue that actors somehow manage to deliver with straight faces (i.e. Lines like “I was with the Navy, not the Navajo” or “Wait until I tell my mom!”). Don’t even ask me how many times characters told each other to run. Probably the worst offense comes with the casting. I’m not denying that these are talented actors. From big roles to small ones, each of these cast members have been in roles where they had a strong presence on screen. Now, their presence includes running away from dinosaurs and looking good in sweaty clothes. Simpkins was cute and likable in movies like The Next Three Days and Iron Man 3. Now, he’s an OCD dinosaur nerd who recites species like he’s a dictionary. Robinson was solid in in the coming-of-age drama The Kings Of Summer. Here, he’s in the cliche Gothic-teen phase like those characters you’d see from “Degrassi.” Howard’s resume needs no explanation. Her acting ability is worth more than the pretty-faced ditz role she’s forced into this movie. And Pratt? Ugh. Pratt is the worst. After making as strong a debut as he did in Guardians of The Galaxy, director Colin Trevorrow did the worse thing you possibly could do to Pratt in this movie: he made him boring. Again, the visuals are amazing. Whoop-de-do. The more I offer the visual effects and the fight sequences as the movie’s strongest points, the more irritated I get at knowing I’m writing the same criticism over, and over, and over, and over again. 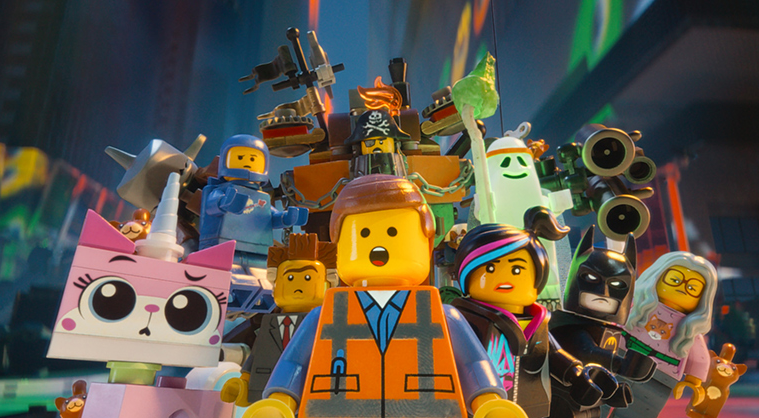 Yes, the visuals are amazing, but are they good enough to substantiate the movie’s flaws? The original Jurassic Park revolutionized computer imaging years ago when you saw the life-sized dinosaur for the first time in 1993. 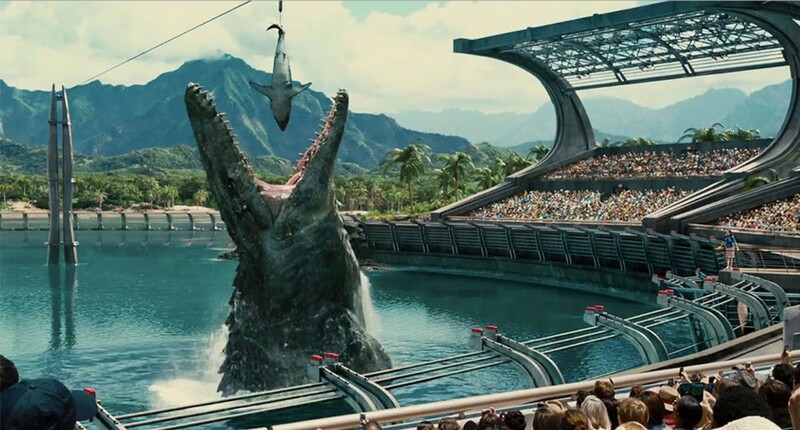 What big achievement can Jurassic World boast about? Continuing the trend that Jurassic Park started. That’s it. Great visual effects mean nothing if a plot is not strong enough to stand on its own two legs. Is one character’s solution to outrunning a giant dinosaur seriously to release a bigger, scarier dinosaur? What was she going to do when either dinosaur was finished? And on that note, is she seriously running and doing all of this leg work in high heels??? I’m seeming pretty harsh with this movie. I know it, and I’m sticking by it. The more I thought about my experience with this movie, the more irritated I get at the movie’s ignorances of itself and its audience. This movie’s premise was not the worst thing in the world. Guardians of the Galaxy had an even more preposterous idea to its story with talking trees and raccoons, and it pulled it off with humor and with heart. This movie copied what Jurassic Park did first and better, and it’s artificial efforts show. It needed to understand how prehistoric sequels are nowadays, and how badly it needed to evolve from it. A lovable group of space idiots. Now here’s a movie I wasn’t expecting to be any good. 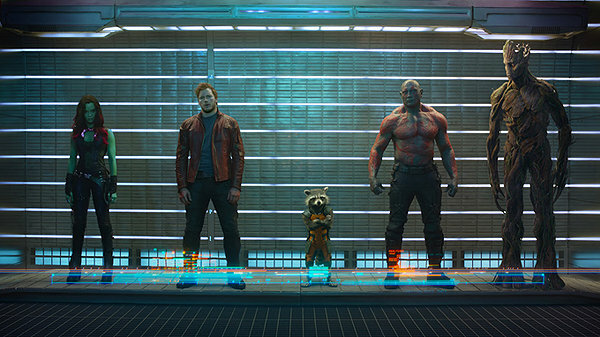 No matter how you phrased it to me, I went into James Gunn’s Guardians of the Galaxy completely expecting to hate it. None of the heroes were as popular or as interesting as the other characters Marvel had to sport in its universe, it’s a sci-fi buccaneering adventure about an evil race intent on destroying/ruling the galaxy (I wonder where we’ve seen that before), and on top of all that, and it has a talking raccoon and a tree as two of it’s main characters. Believe me, I went into this movie fully expecting to dislike it on all counts. Turns out I was wrong on all of them. Sounds like a lot of characters to deal with, I know, but don’t worry: the movie does a better job at explaining them than I did. Their fates become intertwined with that of Ronan (Lee Pace), a vicious hunter who will stop at nothing until he has taken the infinity stone for himself and uses it to destroy his enemies. It’s up to Quill, Rocket, and the rest of the troupe to rise up and defend the galaxy from Ronan and the threat he holds with the infinity stone. Written and directed by James Gunn, the wacko that directed the 2010 satire film Super, Guardians of the Galaxy is a wacky, oddballish film, a movie that doubles both as a sci-fi blockbuster actioneer and as a space comedy parodying… well, itself really. The biggest concern I had with this movie was how it was going to handle itself, because it really had everything working against it. Think about it: talking animals and trees, a copy-and-paste space plot, and a director whose work before this was a line of small-budget independent films. How on earth was any of this going to work? It just loves to make fun of itself, so much so that I want to call this a comedy more than science-fiction. The element that stands out the most in the film is ironically the one I was most worried about: Rocket. Oh my gosh, was this guy a big ball of laughter. Cooper was excellent in voice performance, shooting out snazzy, snarky, sarcastic one-liners like he’s a New York taxi driver. But it’s not just his voice performance that I love so much about the character. It’s how he’s animated and modeled too, with animators giving him life through his detailed, intricate emotions and movements as a CGI character. Rocket is much more than just another Guardian. He is, in many ways, the life of the film: a living, breathing embodiment of emotion, sentiment, sarcasm, hilarity and attitude. Every attitude that the film is, at least. There’s no way to get out of the film’s silliness, but you shouldn’t let that stop you from enjoying it. Believe me, I tried. I went in fully equipped and prepared to blast this movie with a negative review, and I came out instead feeling like a kid after he finished watching his favorite Saturday morning cartoon.